It's a throwback Thursday! I have to give an ode to one of my old friends, a longstanding spot of shopping with gal pals while gossiping and finding the cutest things, Aldo. Aldo has been always been a shopping staple in our lives whenever you'd hit the mall for that R&R, because you can always trust to find affordable, high quality shoes and accessories that are on the cutting edge of style. Throughout the years, they've really kept to their roots of being young, positive, authentic, and universal, with something for everyone. Now they're making sure that each of their store locations exude an enjoyable shopping experience true to the brand. This weekend starting tomorrow, Aldo will reopen its flagship store in the Miracle Mile Shops at Planet Hollywood Resort & Casino Las Vegas and I'm so excited to announce that I will be hosting an in-store event on Saturday, May 4th! There will be plenty of gift card and promotional giveaways, sweet treats, a super fun photobooth, 15% off all purchases, and a live DJ to get the party started. I'd love for anyone of you living in Las Vegas or happening to visit this weekend to stop by and say hello! I'll make sure you have a great time =) Thank you and I'm definitely looking forward to seeing some of your beautiful faces there! 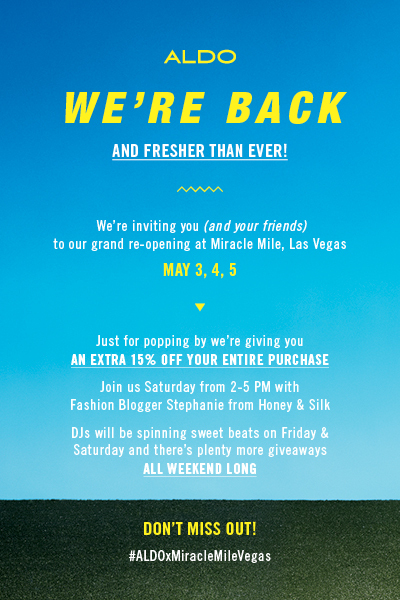 Visit me Saturday May4th at Aldo in Miracle Mile Shops at Planet Hollywood, Las Vegas! First of all I LOVEEEE these heels and I need all of them! Secondly you are such an inspiration and I wish I could be in Vegas with you again.